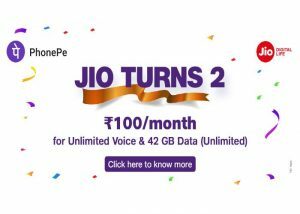 Reliance Jio is celebrate 2 year anniversary and announced a new offer for its subscribers. Under its ‘Jio Turns 2’ scheme, the telecom operator is providing cashback offer of rupees 100 on its best-selling plan of rupees 399. 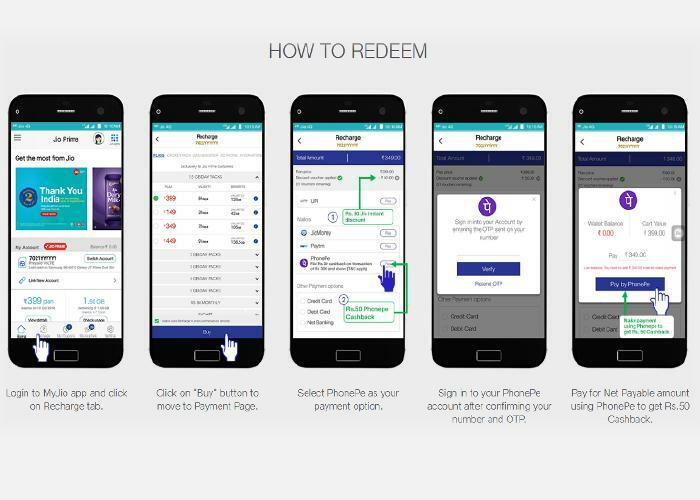 The plan will effectively cost rupees 299 for users who get the recharge via PhonePe. Reliance Jio’s rupees 399 plan offers 126GB of data in total for a validity of 84 days. This is three months validity, which comes to 42GB per month on average and one month means 28 days. The plan also includes unlimited free voice calls and 100 SMS free per day. Users will get a discount of rupees 50 upon making a recharge of rupees 399 with the MyJio App. So when they choose this plan, the price will reflect as rupees 349 as the discount of rupees 50 will be deducted from the original price. In addition to this rupees 50 instant discount, those who pay via PhonePe will get another rupees 50 cashback, which will bring the effective price of the recharge plan down to rupees 299. The offer will be valid till September 21, 2018. Click on recharge option and select rupees399 recharge plan. 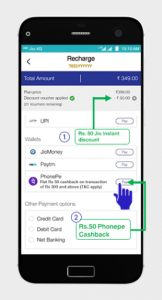 On the payment mode page, select PhonePe from the list of available wallet options and click next. Link PhonePe account by verifying through one-time password. Click on ‘Pay by PhonePe’. Note:- look for rupees 50 Jio discount voucher on payments page on Step 2 and 3 before moving to make payments. If the discount voucher benefit is not visible, close the app and restart the process again.